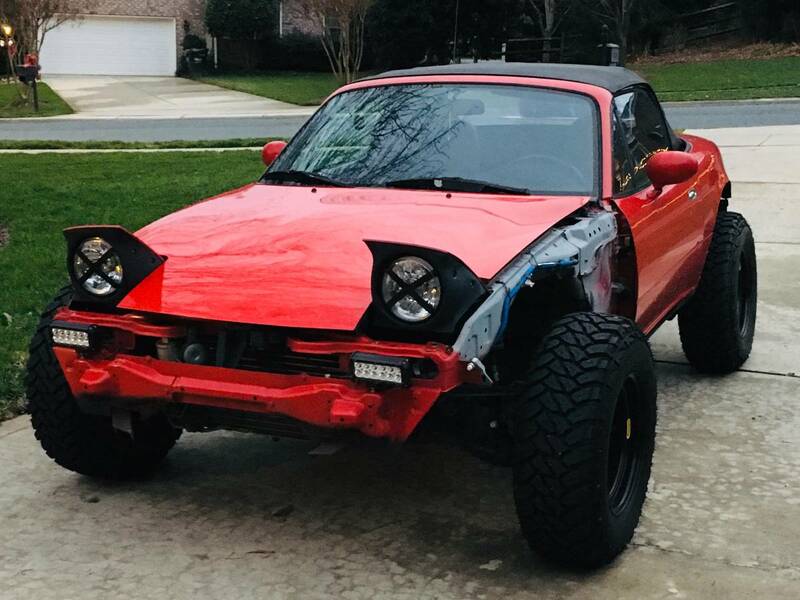 "Hey, what we need is a lifted Miata" -- said nobody ever. Actually...this is far more desirable of a car than a Pontiac Aztec, Nissan Murano CrossCabriolet, or anything made during the evil Daimler-Chrysler merger era. Anyway, find this 1992 Mazda MX-5 Miata offered for $4999 in Charlotte, NC via craigslist. Tip from Rock On! Want a fun car guaranteed to make you smile? This is it! Clean title 1992 Mazda Miata with a 3 inch pacco lift kit and huge wheels! This car is complete and ready to enjoy! No trades. I'm not saying this wouldn't provide some level of fun, but the off-road Miata concept is inherently idiotic. This particular car is a perfect example of that. By doing this modification, you're removing the Miata's strongest assets (performance, handling, maneuverability, etc.) and creating a really light-duty off-roader. There's not a lot of serious terrain this could be used on. Lifting it and adding bigger tires and steel wheels is only going to add strain to the drivetrain and suspension. No mention of engine upgrades or even gearing changes to handle the mods. It's hard to tell in photos, but this doesn't even seem to have a simple roll bar. Not ideal in a convertible off-roader. Without some more equipment, this toy is all show and will spend it's time at the beach. To do this right, you'd be investing more post-purchase. But at this price, you can get a 4-cylinder Jeep that's more capable even in stock form. As a "cute" off-roader, even a Samurai/Sidekick/Tracker would be a better choice than this Miata. I generally agree with your assessment. However, this would be fun in a dirt road rally type scenario. I rented a jeep in northern AZ this summer and went on a really cool dirt back road. It was a bit muddy, there were a couple of back trails that I needed the lift on the jeep, the 4wd wasn't really necessary for the most part. This thing would have been a champ on that drive with the lift. You're being rational. A stock Miata isn't rational in most accounts. A lifted Miata is only rational for the most disturbingly twisted car guys. I love it. Everything is better with a slammed dually. For those wondering the front fenders on a Miata were made of pure diamond nearly uncutable. Or the owner is amazingly lazy or didn't have a sawzall. He probably sold the front fenders to buy those tires. Or meth. The suspension lit looks like the parts for the off road version of the Exocet. 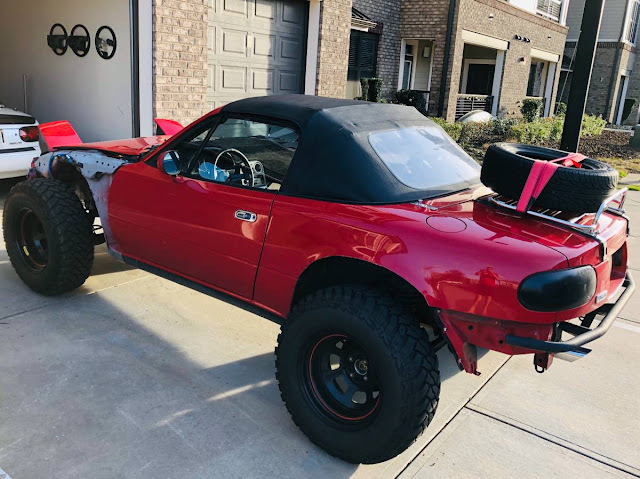 I have friends who have driveways where this is the only Miata that would get through, so maybe this would be a fun toy. A frisbee would make more sense strapped to the deck lid than the tire, given its relatively diminutive size compare to the Nittos. Plus, you know, frisbee. I think the frisbee would be more useful in a blow out situation than the undersized spare. Cause at least you could play some disc golf while you waited for AAA. You have a wisdom about you, my friend. Don’t put that in a bushel basket. Why bother??? I like oddball cars and trucks, but this is just too damn weird. And wrong.